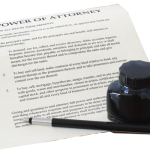 A power of attorney is defined as a legal document that gives the person of your choice the power to act on your behalf. If you do not have a durable power of attorney and you become incuuapacitated, it becomes up to your relatives/family members to decide who will manage your affairs. When an individual is either ill or incapacitated, it is often necessary for someone to step in and handle the financial and/or healthcare decisions. To avoid leaving this decision up to a court, you need to obtain a power of attorney that gives the authority to make decisions to the person of your choice. Should you ever become incapacitated and unable to handle matters on your own, you’d want a durable power of attorney in place, so that the document stays in effect once you are incapacitated rather than becoming invalid, as ordinary powers of attorney do in the case of incapacitation. Although it is possible to have just one power of attorney document for both medical and financial power of attorney, it is not advisable. You may not think that you need a power of attorney if you are married or have a living will or some other circumstance. However, a durable power of attorney will make everything easier for your family should you ever become incapacitated. Some institutions can even refuse to work with a spouse without a valid power of attorney document in place, and a living trust is not a complete substitute for a durable power of attorney for finances. Contact LegalHelpLawyers.com for legal assistance with power of attorney today!